What’s the connection between a sustainable, racially equitable food system in New England and UNH? As of earlier this year, it’s two newly appointed professors, and the CELEBRATE 150 gift to the university’s Sustainability Institute that makes their positions possible. Durham resident and philanthropist Tom Haas established the Thomas W. Haas Professorship in Sustainable Food Systems through the New Hampshire Charitable Foundation in 2013 to advance the mission of Food Solutions New England (FSNE), a regional, collaborative network based at UNH dedicated to advancing a sustainable food system in New England that is increasingly self-reliant. Haas noted at the time that the Sustainability Institute was already a leader on multiple fronts and intended the gift to propel its academic and practice-based pursuits in the field of sustainable food systems. Joanne Burke, a UNH clinical associate professor of nutrition, was the first to hold the Haas Professorship. In February, Curtis Ogden and Karen Spiller were named Burke’s joint successors — and, as prominent national leaders in food systems sustainability and social justice, the first “community practitioners” to hold the position. With a background in health and equity-focused initiatives, Spiller’s emphasis as a Haas professor is on connecting the work of FSNE — particularly its racial equity work — to UNH students, faculty and staff through lectures, workshops, and collaborative scholarship. Ogden brings a background in education and the intersection of racial justice and environmental sustainability to the role. 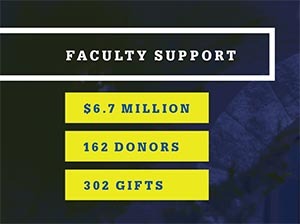 The Thomas W. Haas Professorship in Sustainable Food Systems was one of several new faculty positions made possible by the generosity of donors who understand that named and endowed positions enable UNH to attract and retain the kind of talent that opens doors to new possibilities for students. Joining Tom Haas on the list of those who have done so are Josephine Lamprey, who established the Josephine A. Lamprey Professorship in Climate and Sustainability; and Brian Peters ’77 and his wife Ann-Frances ’78, who created the John and H. Irene Peters Professorship in Education to honor Brian’s parents and his own deep and abiding ties to UNH. Before he succumbed to a heart attack at the age of 48, it was John Peters’ dying wish that his sons both earn a college education. Not only did both Brian and Douglas go on to graduate from UNH, so did their mother, Irene, who enrolled as a 39-year-old freshman shortly after her husband’s death and earned both a bachelor’s degree in psychology and a master’s degree in education. For Brian Peters, endowing a professorship in education seemed like the most fitting way to honor his father’s wish, his mother’s achievements and the UNH professors in the College of Liberal Arts who taught him how to think critically, write clearly and apply theory to facts and facts to theory. Lamprey, a retired businesswoman and North Hampton, New Hampshire, native, was inspired in part by the work of climate researcher and associate professor Cameron Wake ’93G to establish the professorship Wake now holds. Established in 2012 as a five-year fellowship, the professorship is one prong of Lamprey’s climate- and sustainability-focused philanthropy at UNH. She also supports climate fellows in the UNH Sustainability Institute, the green grid at the UNH/Cornell Shoals Marine Laboratory and social innovation programs at the university’s Carsey School of Public Policy.